CAFE DESIRE BEAN TO CUP COFFEE MACHINE.. This could be one of your best choice..Why? You got the best deal •	What did I get? You got 3 kilograms of premix for Rs 999/- •	What so big deal about this? Average price of 1 kg Cafe Desire brand of premix is Rs 599, but with this new Red blend range your effective price per kg is Rs 333 only •	How would be the taste and quality? We bet you will love this .. This could be one of your best choice..Why? You got the best deal â€¢	What did I get? You got 3 kilograms of premix for Rs 999/- â€¢	What so big deal about this? Average price of 1 kg Cafe Desire brand of premix is Rs 599, but with this new Red blend range your effective price per kg is Rs 333 only â€¢	How would be the taste and quality? 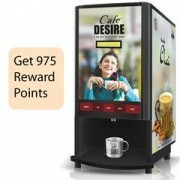 We bet you will love..
Coffee tea vending machines offered by CafÃ© Desire are highest selling and best coffee machines available in the country. These automatic tea coffee vending machines are very good, convenient and ideal for places like small medium and large offices, educational institutes, industrial canteens, hospitals, software companies, hotels, restaurants, malls, cinem.. Thanks for visiting. There is nothing better than charming coffee aroma which flows into your sleepy morning. Everyday millions of people enjoy their lives by drinking a fragrant dark morning drink. The origin of coffee is covered with mystery. Thousands of legends have been told, hundreds of gods have been created and millions of minds have been lured with .. Ingredients: Milk Powder + Creamer + Tinch of Vanilla and Chocolate + Instant Coffee + SugarDiscover the ease & convenience of making a coffee shop quality Cappuccino with Cafe Desire Cappuccino Instant Coffee Premix. Escape from your everyday schedule to enjoy a delectable, coffee shop style cappuccino without having to leave your office or home prepare.. This could be one of your best choice..Why? You got the best deal. What did I get? You got 3 kilograms of premix for Rs 999/- •	What so big deal about this? Average price of 1 kg Cafe Desire brand of premix is Rs 599, but with this new Red blend range your effective price per kg is Rs 333 only •	How would be the taste and quality? We bet you will love this •..
COFFEE MACHINE RENT FOR 24 MONTHS - 2 LANE..